Can you? Yes. Should you? That’s a more complicated question. Humans are the top dog species on the planet in large part because of our ability to adapt to whatever we need to in order to get the job done. Only have a right handed bow, really need to shoot that boar? You got it. But, unless you’re in a life-or-death scenario (which, since you’re reading this right now I can probably assume you’re not) we can afford to be a little choosy about how we do things, especially if we’re starting out. The weird technical thing about bows and handedness, a right-handed bow is held in the left hand and drawn with the right. Confusing, right? For most of us, one eye will have a bit of an edge on the other in terms of giving us accurate information due to something called the parallax effect. 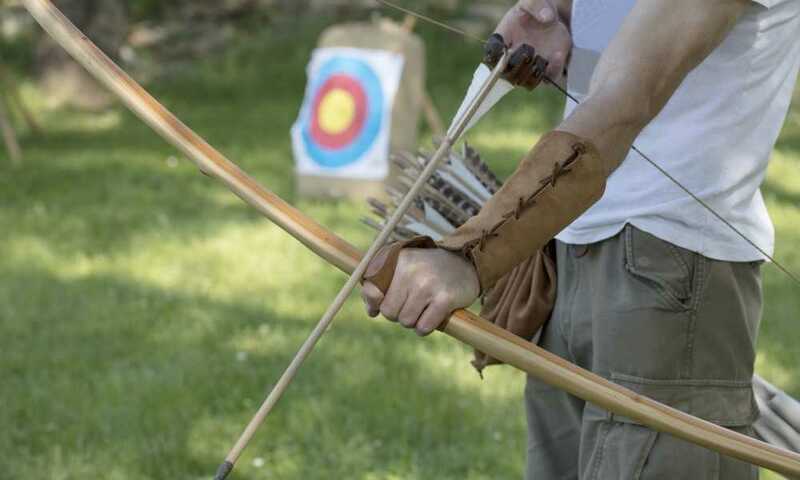 Typically that dominant eye is opposite our dominant hand, which in archery is a disadvantage unless we orient the bow based on our eyesight rather than our handedness. Parallax is an apparent displacement in the visible position of an object viewed along two different lines of sight. 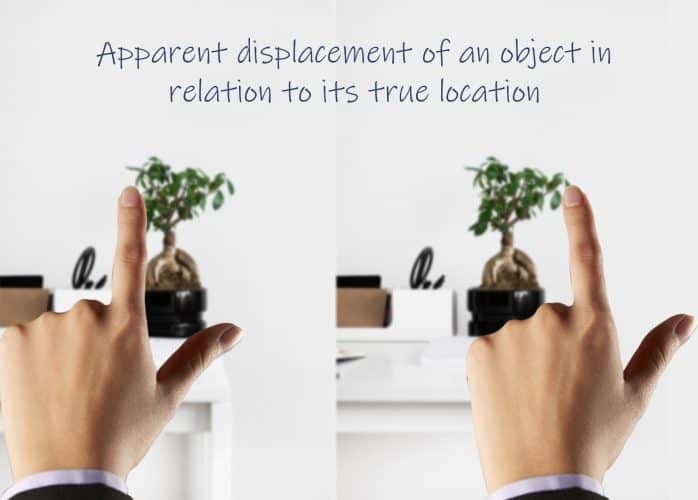 Objects that are closer to us have a larger parallax (apparent displacement) than those objects that are viewed from far away. In other words, parallax is an optical illusion that presents itself as the displacement of an object in relation to its true location. Example: Extend your arm out in front of you and point your index finger up. Now stare at the index finger momentarily then close your left eye. Now open the left eye and close the right eye. If your finger appears to move horizontally as you switch eyes then you are experiencing the parallax effect. If you’re a left eye dominant person and you’re shooting a right handed bow, you will have to compensate for that slight misperception in your eyes when shooting. This is known as windage in archery, and a good number of people learn to compensate for it. 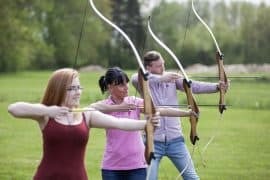 But if you’re just learning to shoot with a bow, especially if you’re young, it is better for you in the long term to learn to shoot with your eye dominance rather than whichever hand feels more natural when you first start out. The less windage you have to deal with, the more you can trust what you see in your sight. That makes for more accurate shooting. Learning to shoot with your non-dominant hand will probably be awkward at first. 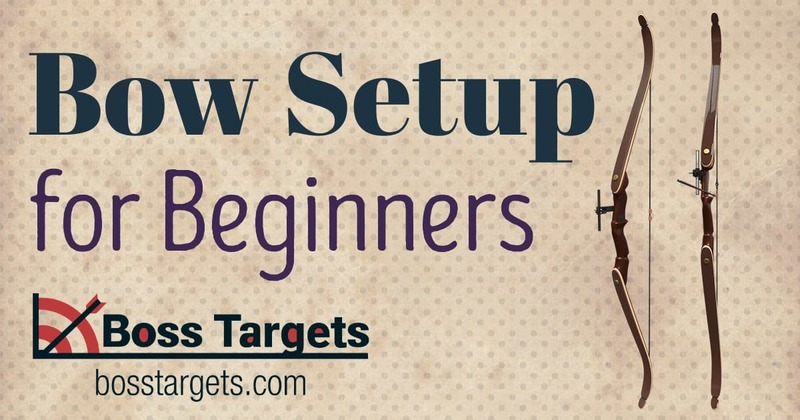 The initial hump of difficulty might be a bit higher, it might take longer to feel comfortable when shooting, but you will be far more accurate far more often if you learn to shoot this way. What about just closing that eye and using the other one? I don’t know which eye is my dominant one, how do I find out? But I have a right handed bow already and I’ve been shooting a few months now, do I really need to switch? Now if that eye-dominance means you’re using a left-handed bow, I do have some unfortunate news for you. As with most things in the world, archery gear is often going to bias towards right-handed people. This has been true for a very long time, there’s a longstanding bias of right-handedness in the cultures that shaped our world today. In ancient Egypt, the gods used their right hand to bestow blessings and honor upon the mortal world, while their left hand held curses and plagues. In Ancient Greece “The Pythagoreans listed ten first principles, each of which consisted of pairs of opposites, and it comes as no surprise that right is listed on the same side as male, straight, light, good, etc, while left is listed alongside female, crooked, darkness and evil. (History of Handedness)” In Rome the custom of shaking the right hand was meant to allow the shakers to look at the waist of the other person, ensuring that they weren’t armed and about to stab them when their back was turned. In the Bible, Ehud was a left-handed warrior who snuck into the tent of the enemy leader’s camp with a long sword that wasn’t noticed because he was a left-handed person so his weapon was on his right side. He assassinated the King of Moab and escaped. Not a very heroic way to do it in the ancient mind. What does all this history mean for us now? Since the overwhelming majority of people are right-handed, left-handed technology all across the board is going to be harder to find and, sometimes, more expensive. Left-handed guitars are more expensive on average than right-handed ones, some kitchen tools are designed explicitly for right-handed use, but archery isn’t quite so bad as all that. And people don’t generally assume left-handed people are evil just because they’re left-handed. Generally. The differences are more specific and less drastic in terms of cost when shooting left-handed. 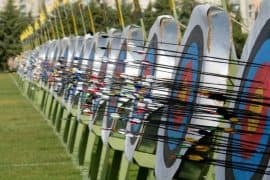 Since archery is ideally set up around eye dominance instead of handedness, there’s a good deal more left-handed bow gear than one might expect. For every piece of equipment an archer might need, there is a left-hand design. Lots of sights and release aids are also designed “ambidextrous,” meaning they can be adjusted (sometimes you need tools to make sed adjustments) for a right or a left handed shooter. That might mean dealing with sighting information that’s upside down though, so that’s an important consideration when you’re buying or customizing a bow for yourself. 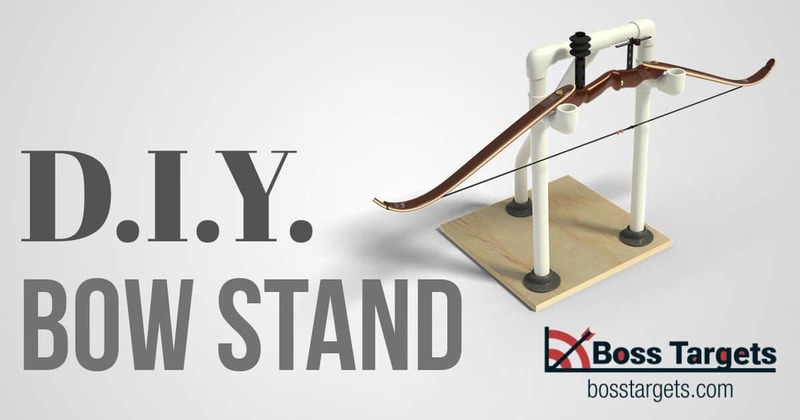 Bow shops also might not carry everything you need for a left-handed rig, and they will almost certainly have a far smaller selection of left-handed equipment. Still, most shops are happy to special order gear for you, though that might translate to a slightly higher cost. At least you’re not a guitar player. This further complicates our conversation about how our eyes relate to the accuracy of our shooting. There are drawbacks and advantages to shooting with just one eye open or with both eyes, and professional archers who shoot in all sorts of different ways. Removing one eye removes a variable, but as human brains are designed to use both eyes to judge distance(this is called stereoscopic vision), that creates some problems as well. 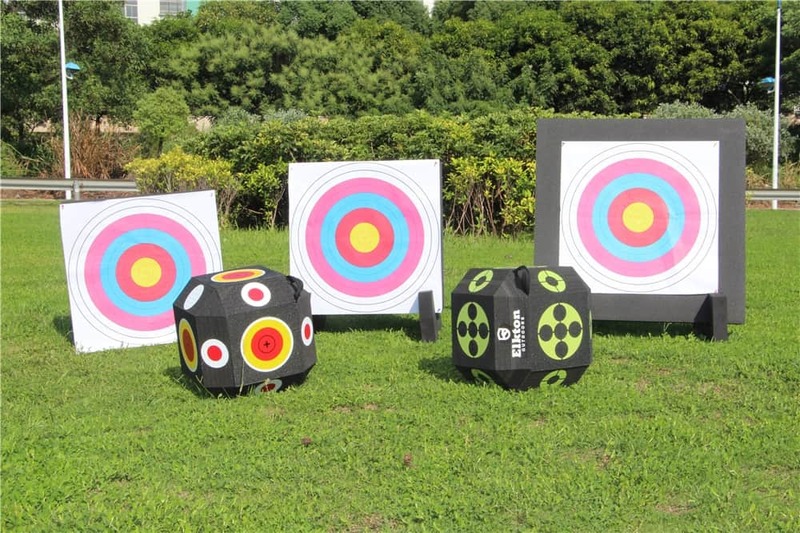 Shooting with both eyes open gives you a wider field of vision, which is good. The more input you can take in, especially in low-light environments, the better. 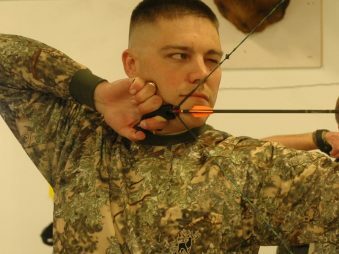 But if one eye is dominant, this means that sometimes depending on the distance of the target, amount light available, and a bunch of other factors our subconscious brain makes note of when we’re doing something like shooting a bow, sometimes our eyes will compete over which one gets to dominate our perceived vision. On the other hand, shooting with one eye closed will give you a more consistent experience of targeting, but you will have a harder time seeing since human brains are used to using both of our eyes to see. In low-light conditions or areas with a lot of variance in cover, you might find that your one-eye set up can make it harder to sight targets as well. This is a factor mostly in hunting, but it applies to target shooting too. Randy Ulmer, an accomplished competitive archer, and bowhunter shoots with one eye closed, and occasionally shoots with a blinder on his non-aiming eye. Rather than just closing his eye he removes it entirely as a variable. 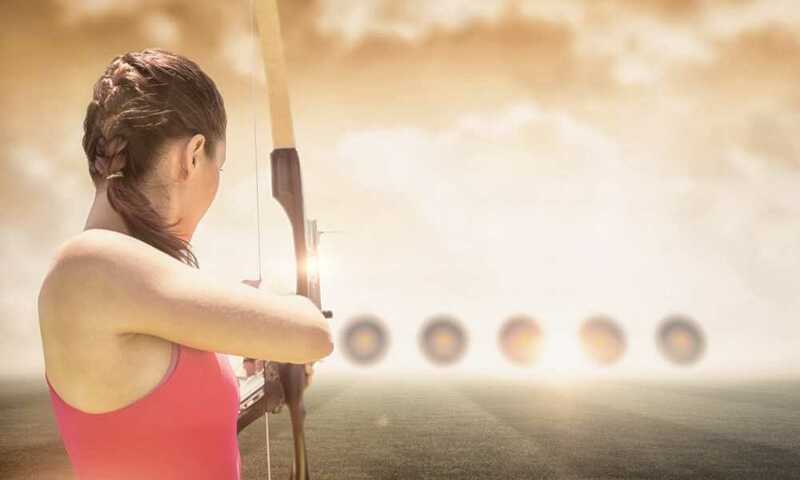 Other professional archers shoot with both eyes open, or with one eye squinted to maintain a wider field of vision but lessen the likelihood of that competition between the eyes for dominance in any given shot scenario. For more on which eye to use (or using both) look here. There’s more than one way to skin a cat and there’s more than one way to shoot a bow. That doesn’t mean you aren’t making more trouble for yourself than you need to. You should never choose to shoot in a way that works against your body’s natural tendency when it comes to eye dominance. 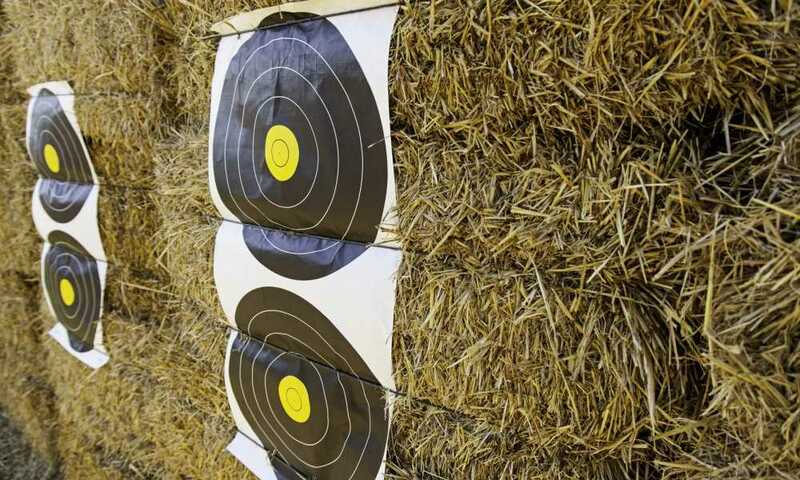 After hours and hours and hours of practice, you might develop some skill using your non-dominant eye to shoot, but you’re only working against yourself. The same is true to a lesser extent when shooting with your non-dominant hand, but the difference is that the benefit of having a more accurate sight on the bow far outweighs the learning curve of learning to hold and shoot with your non-dominant hand. 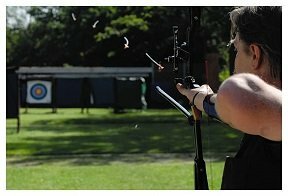 This might seem like a whole lot of complicated content to deal with when you can just pick up a bow and shoot it at something, but what makes shooting sports different from other kinds of sport is the fact that these factors, windage, eye-dominance, etc., those variables have an immense impact on your success as a shooter. There are a variety of skills in other sports, free-throws and dribbling and speed in Basketball, for example, so you might be able to neglect one of them and still play well. But in archery, your eyes carry the complete lion’s share of what makes a shot accurate or not. This is what it means to be an archer, these are the things that matter. There are a few different ways to test this, but I’d suggest starting here. Of course, there is a chance that you might be one of those people who doesn’t have a dominant eye if that’s the case good for you. You can probably just go with whatever bow you have access to or whatever hand is your dominant one, in that case. If you don’t have a dominant eye and you’re also ambidextrous, I don’t know, flip a coin? Just kidding, if you’re in that small minority of people I’d suggest learning to shoot right-handed since you’ll have an easier time finding gear. That depends on what you want out of it. 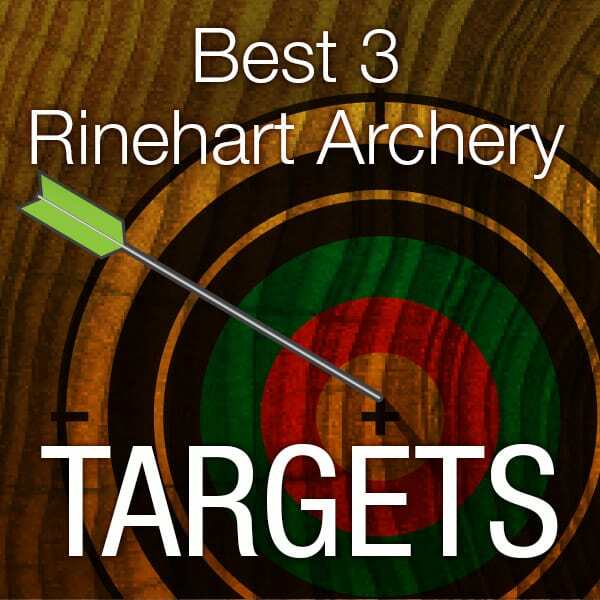 Do you like shooting at targets in your backyard or at the archery range and don’t really want to hunt with a bow or enter archery competitions? Then don’t worry about it, have fun. Archery as a hobby is 100% a real option here. But if you want to hunt or compete as a sportsman with your bow, or if you’re like me and you’re obsessed with being as good as you possibly can be at something, it is better to buck up now and do the work to retrain yourself to shoot with your dominant eye. You’ll be more accurate, which means you’ll do better in competitions, and, if you’re a hunter, that means you’ll be less likely to miss an animal completely or hit them in a spot that ruins the kill or causes unnecessary suffering.